So what better way to start off this month than with a $20 gift certificate giveaway to Sunglass Warehouse! I usually order my sunglasses online and I'm glad that I now have another site to shop from. I love that you can get sunglasses like your fave celebs in the Celebrity Sunglasses section. They even have a page to help you figure out which frames will compliment your face shape. I was sent these wayfarer sunglasses. Anyway, they look great and the quality is pretty good for the price. 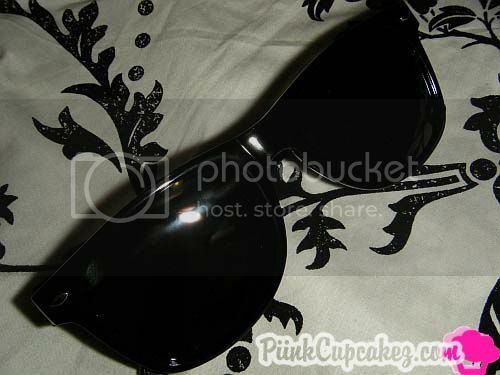 A $20 gift certificate to Sunglass Warehouse. This giveaway is open to U.S and Canada. 3. Leave a comment with your NAME, EMAIL, and which sunglasses you're loving from the site. 1. Follow PiinkCupcakez on Twitter. 2. Follow Sunglass Warehouse on Twitter. 3. "Like" PiinkCupcakez on facebook. 4. "Like" Sunglass Warehouse on facebook. 5. Follow the Sunglass Warehouse Blog. Please make sure to follow all the rules correctly or your entry will not count. Disclaimer: This giveaway is being sponsored by Sunglass Warehouse. Sunglasses in this post were sent for review. I have been dying for a pair of Aviators.